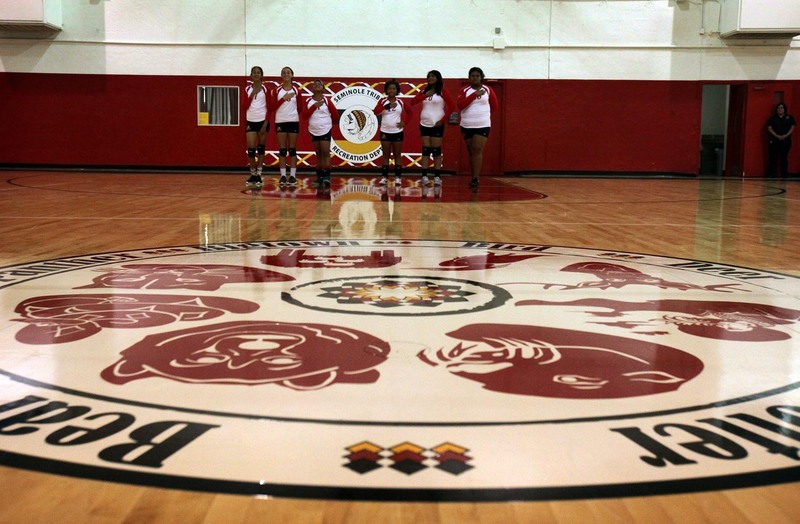 BIG CYPRESS — The scent of new paint and wood floors was still thick Oct. 18 when Ahfachkee School’s Lady Warriors middle school volleyball team christened Big Cypress Reservation’s newly renovated Herman L. Osceola Gymnasium with the last game of the season. Gone from the 27-year-old facility was its old worn wall padding, dank paint and heavy foam floor mats. 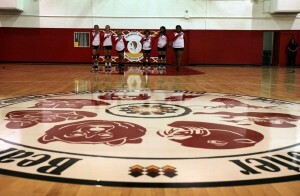 For months during the “facelift,” the team and the girls’ varsity volleyball team had been forced to play “home” games in rival school courts. The new stress-relieving floor, similar to those of professional NBA courts, is constructed with a moisture barrier, a thick layer of resilient pad, two layers of hardwood subfloor and a maple parquet top layer. The “give” of the floor absorbs shock, reduces stress on joints and decreases the potential for injury. Boys’ and girls’ varsity and middle school basketball teams were to play the first home games with new home court advantage on Oct. 21 against Everglades High School.